Taylored Cycles offers a unique, mobile bike mechanic service. 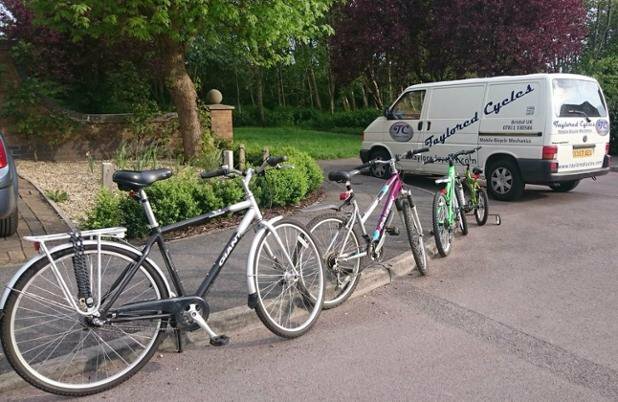 We will come to your home or place of work at a time to suit you, to either fix or service your bike there and there in our mobile workshop. Or if it’s a bigger job like our Premium Service we’ll take it away and return it with the necessary repairs and servicing complete. We will always try to collect and return a bike on the same day. We travel to any location, up to 10 miles from the centre of Bristol. You can make an online enquiry by filling out the form on this page. – This is our most basic service which covers the labour to set up and adjust all the existing parts on the bike. It does not cover the labour to replace any worn parts. – This is a comprehensive service which covers the labour to replace worn out parts and service any of the main bearings that need attention. – This is a Full Service with a strip and valet. We have the facilities to fully clean and degrease your bike. When a bike has had a Premium Service it will come back gleaming and in the best condition possible. – We always recommend having a Valet as part of a service. But if your bike is in good working order and doesn’t need a service we can give it a full degrease and clean. Contact us for a quote for any jobs not listed or specific tasks. We can accept payment by cash, cheque and by debit or credit card. or fill out the booking enquiry form here. You can make a booking enquiry by filling out the booking enquiry form HERE.